I have had my crankshaft crack tested, and they have come back saying that there are some small crack on the big ends. Now they are saying that they can grind the crank undersized which may get rid of the cracks..
is the true or will the cracks just be waiting to come out again ? Should i just retire this crank for a road motor? I'd think it'd just crack again, now that it has less metal. Steel crank an option or is it historic? Small shallow hairline cracks are not unusual from heat and stress cycles and show up in the surface hardening in bearing journals. I’d have it reground and not be too concerned about it. Make sure the journals have radiuses to reduce the risk of crack propogation between journal and web. Should have it stock from memory, just something else to check. Minis use a 3 web block which can lead to crank breakages from high rpm. Long term I’d be saving up for a steel crank. 1275s use either an EN40B or EN24 crank material which is case hardened. The case hardening is not that thick and grinding may go through it. This will leave the crank with inferior wear and fatigue resistance. Grinding the crank increases the chance of failure. I never met a horsepower I didn't like. Was a Large Journal A+ Crankshaft modified to be a small journal , had been lightened, wedged and then nitrided. mains are on .040" and i think this will take the big ends to the same i think. will see if it can last a few races this season before it gets replaced with a steel item. Can or do they re case harden after grinding? Yes they can. You have to request it tho. Case hardening is to reduce surface wear, not overall crank strength. the above grinding needs to be deep enough to get all the crack out - hence why they say may. they may regrind to min size and not get to the root of the crack. Not just wear. It also improves fatigue resistance. You know I'm as rough as the next guy, but I wouldn't use it. It's not just the crank that is at risk, it could take block, cam, even gears with it if it lets go...sorry,.. I have no cranks left. Is cost vs reward worth it? How much would you be up for if it failed and took out the current engine? Personally I wouldn't risk it. Not unless you've got another engine in the build already. If the crank has been gas or ion nitrided, it's been cracked the whole time. Grind the crank till you get under the cracks, re-nitride, then grind the white layer down to prevent future cracking. 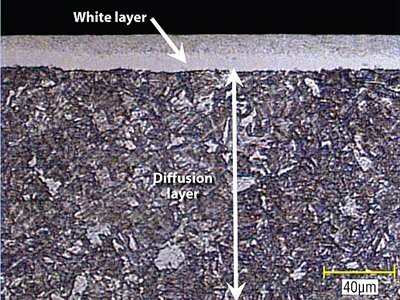 In gas or ion nitriding, the microstructure of the steel changes such that you get a layer right at the surface a few thousandths of an inch thick that appears white when you do a metallograph for looking at these things. This white layer has a lot of spiderweb microcracking that doesn't go deeper than this few thousandths thick layer. If you don't grind it out, these cracks tend to extend deeper over time. If you grind out the white layer, the cracking can pretty much be avoided, but you gotta make sure you leave on enough material to grind it out. Many shops don't, they're worried about grinding through the thirty to forty thousandths of an inch thick hardened layer. Sometimes if the heat treater doesn't use all the tricks, the white layer can be as much as half the case hardening depth. With ferritic nitrocarburizing, cracking is mostly avoided but since it occurs between 900 and 1100 degrees, many crank materials would loose any heat treating they've had done. 4140 steels and 4340 steels could be OK, but 1045 and 5140 steels would be softened up quite a bit. Also FNC tends to leave the part deep black and surface hardness can approach 65HRC. Last edited by Xnke; 15-04-19 at 11:52 AM.